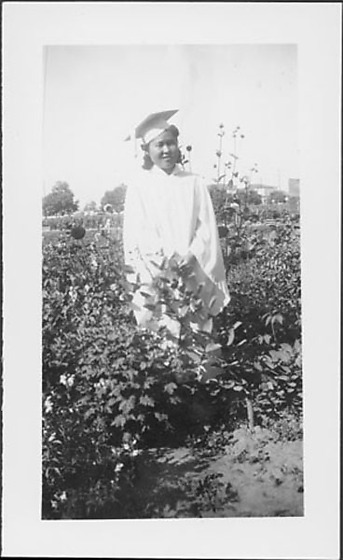 Young woman in white graduation mortarboard and gown standing in a flower garden at Rohwer concentration camp, Rohwer, Arkansas, 1942-1945. Standing in knee-high growth obscuring her feet, she smiles at viewer as she clasps her hands in front of her. Hedge and two-storey structure in background. Same, but smaller image of 97.292.1C.